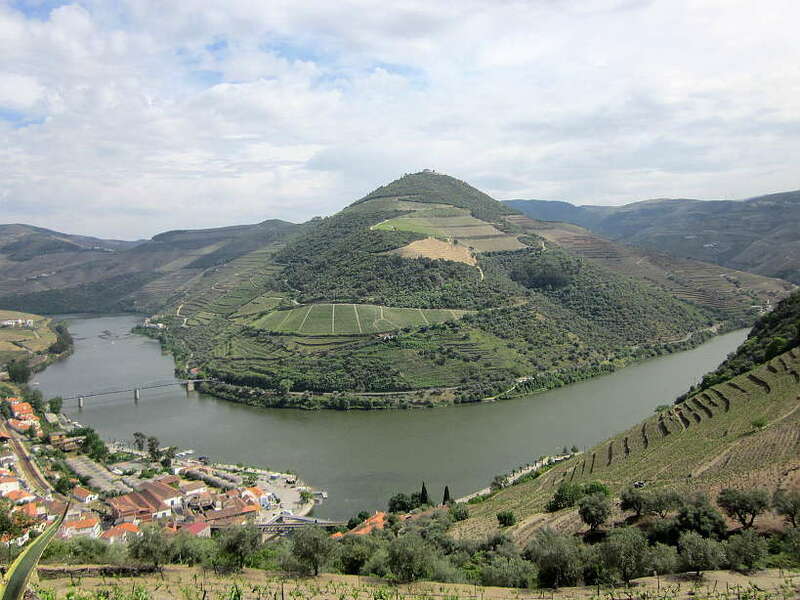 Douro Valley, in northern Portugal, is the first demarcated and regulated wine region in the world. In addition to the famous Port wines, this spectacular region also produces some of the best wines in the world. Our quest for authentic food in Portugal had us discover the delightful Portuguese wines paired with our meals. Pleasantly surprised by the breadth and flavors of the wines, we were eager to visit Portugal’s historic wine growing region. Not only does the Douro Valley produces some of the finest, affordable and underrated wines, it also offers beautiful and magical landscapes. Visiting the traditional and charming wineries nested near the Douro River is a wonderful step back in time. While admiring the views and sipping the amazing red wines, you quickly adopt the local pace and soak in the serene atmosphere. Let’s take a tour of three local wineries and learn about the hidden secrets of Portuguese and Douro Valley wines. 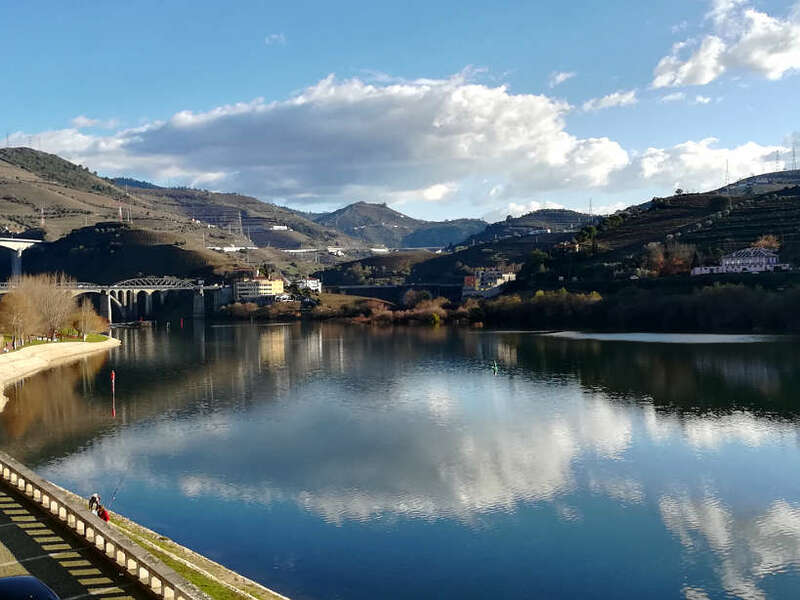 Located only an hour and a half from Porto, Pinhão is the main town to explore Douro Valley wines. To get to Pinhão, you have the choice between three modes of transportation; boat, car or train. With most wineries not easily accessible from the train station, it’s very handy to rent a car. You also get a chance to see the countryside and make stops along the way. Renting a car is very affordable in Portugal. For only €5 euros per day, we rented an economy car from Avis Car Rental company. The only inconvenience is that the sales agent will try to upsell you with anything and everything. One element to be cautious about is the toll pass. You don’t need to take the highway and there are no tollways on the secondary roads. Nonetheless, Avis agents will insist you need a tollpass, when you really don’t. It is true you want to be careful and avoid the tollways, as the road signs can be misleading. Though, overall the trip to the Douro Valley is very enjoyable on the secondary roads. 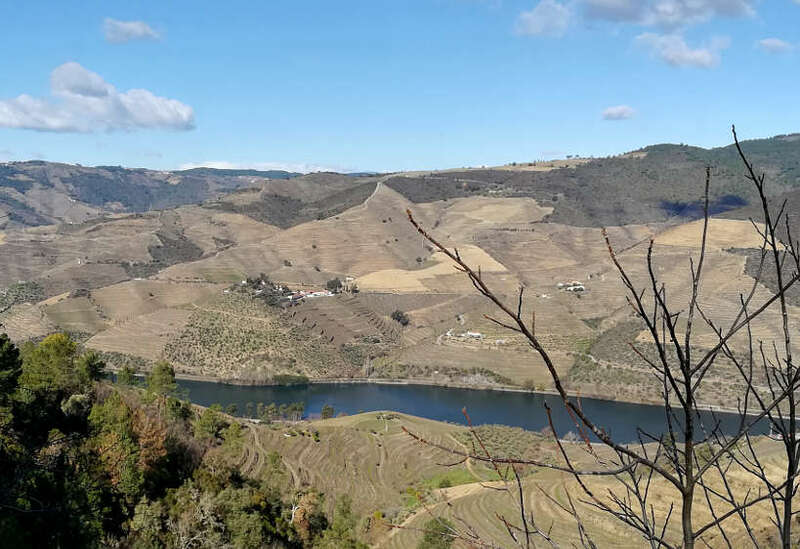 Once you get closer to Peso da Régua, the main town before Pinhão, keep in mind that the only options to cross the Douro River is either in Peso da Régua or Pinhão which is 27km further away. The Douro Valley is an exceptionally beautiful, historic wine region. The area is most famous for being the home of Port Wines, but over the last few decades, exceptional table wines have emerged. Today, wines from the Douro Valley are evenly split between Port and Douro Valley table wines. Temperatures can soar above 40°C (104 °F) during the Summer months and sometimes even hitting 50°C (122 °F). The extreme heat causes the grapes to grow thick skins, which impart unique characteristics to the wines. 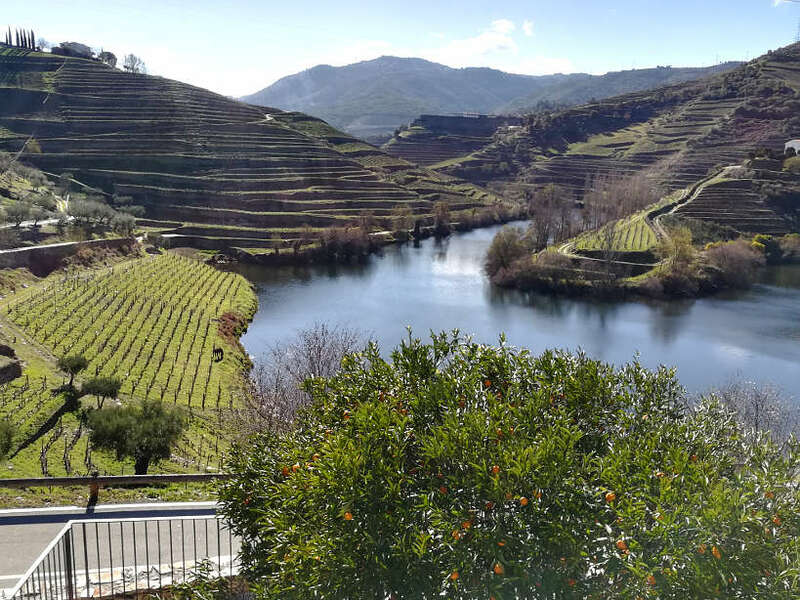 The following three wineries make exceptional Douro Valley wines and are wineries worth visiting on your travels to the Douro Valley. 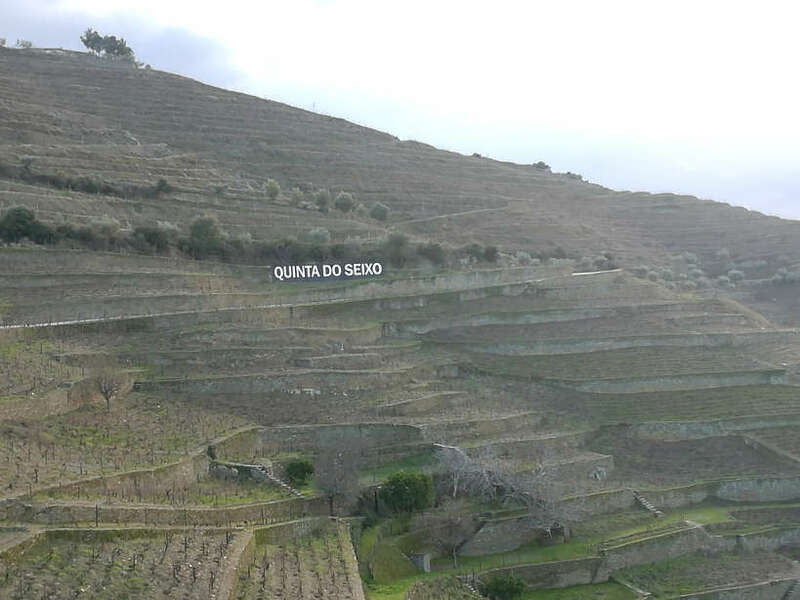 Quinta Nova, which dates back to 1725 is one of the oldest and most impressive wineries in the Douro Valley. During our visit, we learned that since their acquisition in 1999 by Group Amorim, the largest producer of cork in the world, Quinta Nova made the strategic decision to focus on producing only table wines. The goal, the best wines in the Douro Valley. Our intimate tour started in the vineyards, looking out at the 120 hectares (350 acres) of vines. The land is divided into parcels, planted with only one Portuguese grape variety. The top five grape varieties grown at the vineyard are; Touriga Nacional, Touriga Franca, Touriga Roriz, Tinto Cão and Tinta Francisca. One of the highlights of the tour was visiting their onsite Wine Museum or Museu do Vinho. This personal collection of the Amorim Family, tells the story, not only of Quinta Nova but of the wine production in the Douro Valley. 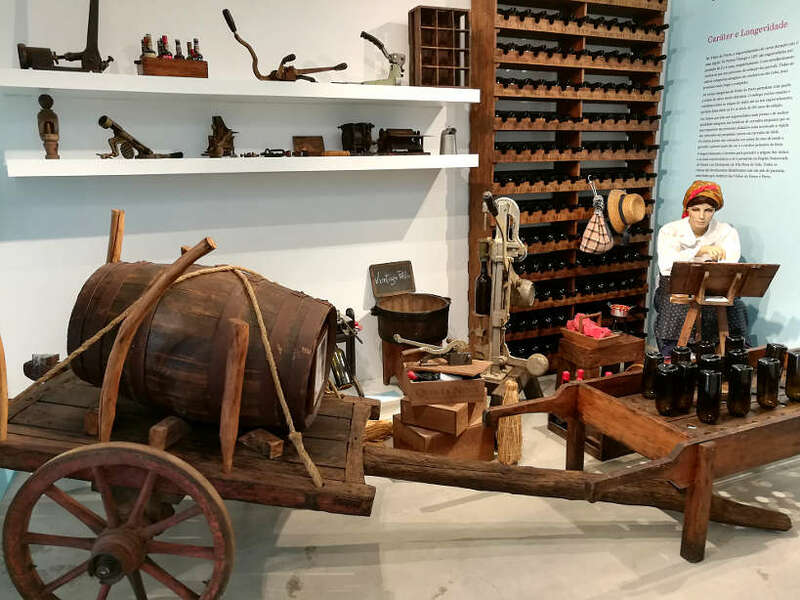 The pieces date back to the 19th century and include relics such as ancient tools for picking grapes, old wooden presses for the wines, the old bottling process, and much more. A fascinating stop to see the old techniques used to produce the amazing wines from the region. 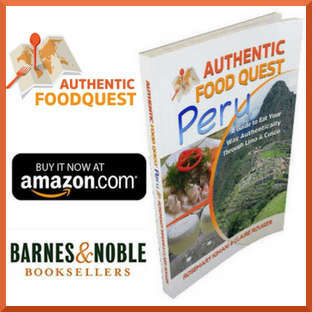 Following the tour, you will want to eat. Conceitus Winery Restaurant at Quinta Nova is a gastronomy restaurant with a focus on local food. At the time of our visit, which was off-season, the restaurant was closed. Instead, we had petiscos (Portuguese tapas) in the tasting room. We were served an overflowing plate of different cuts of amazing ham, olives, cheese, dried fruit, and bread. Everything was incredibly delicious and perfect for accompanying the wines. The atmosphere was relaxed with spectacular views of the Douro Valley. Even though the petiscos cost triple the price you would pay in Porto, the experience is worth it. Besides, you’ll need something to counter the effects of the wine tasting. Three different wines were offered for the tasting. One white wine, Pomares, and two red wines. One red wine was Quinta Nova Colheita and the second, Quinta Nova Terroir Blend Reserva. Each of the wines had distinctive characteristics. The Pomares was light and refreshing, with fruity aromas. The perfect wine for a hot day. The reds were intense, strong in structure and with an elegant finish. The tasting portions are rather robust and equivalent to a full of glass of wine. You’ll definitely want to have petiscos as you relish the flavors of the wines. The wines by Casa Ferreirinha are some of the best in the Douro Valley and worth seeking out on your trip. Famously run by Dona Antónia Ferreira, she was a woman much ahead of her time. She achieved one of the biggest fortunes in the country in the 18th century, confronted the men who dominated Port Wine commerce to produce one of the best wines in the Douro Valley. In 1987, Portugal’s biggest wine producing company, Sogrape, acquired Casa Ferreirinha. The company already owned the famous Port Wine brands Sanderman, Offley among others. 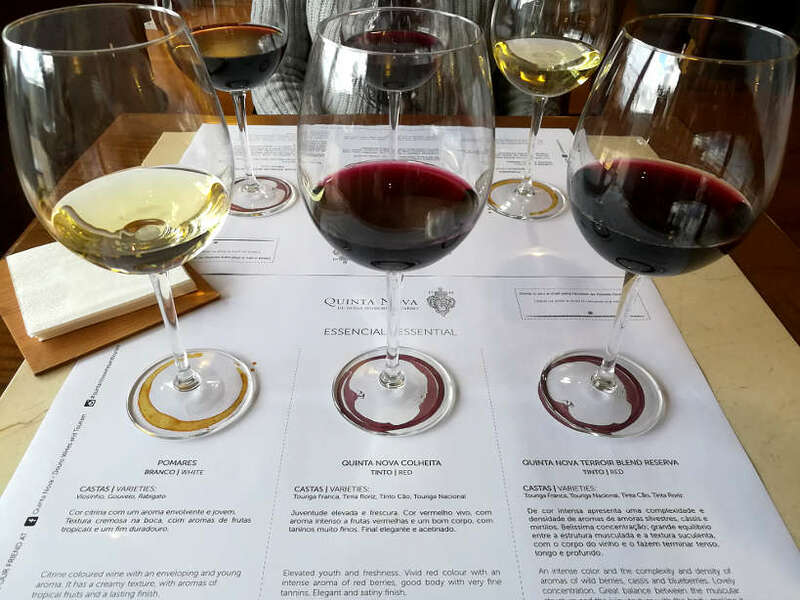 While visiting Quinta do Seixo – Sanderman to discover their port wines, we took the opportunity to taste Casa Ferreirinha red and white wines. The tasting included two different red wines and one white wine. The wines were elegant and not overpowering. The reds had wonderful juicy fruit flavors while the white wine was bright with tropical fruit aromas. 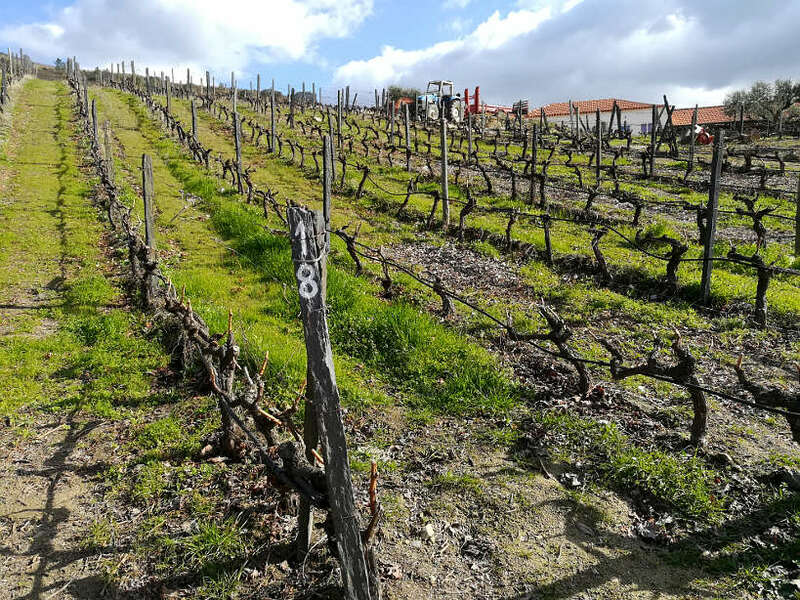 Ferreira wines are synonymous with high-quality Portuguese wine, and under the direction of Dona Antónia, were the reference point for exceptional Douro wines. Don’t miss Casa Ferreirinha wines for their historical importance and wonderful flavors. The vineyard is now co-owned by a Frenchman (of the Bouchard family winemaker in Burgundy), his American wife and a Portuguese winemaker. Traditional winemaking practices are still employed at Quinta do Tedo. The grapes are harvested by hand and the grape crushing process happens in the traditional style, where some of the grapes are stomped on by foot. The vineyard also features a small agrotourism Quinta do Tedo B&B where you can stay and explore the region. Free bicycles are provided to guests and activities such as hiking, canoeing bird watching are available. Located on the hilly slopes around the picturesque Tedo river, you’ll enjoy spectacular views of the valley. 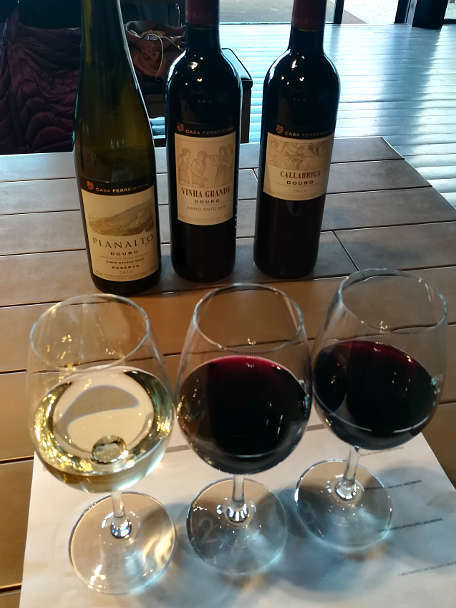 We were surprised to find organic Douro Valley wines and were quite eager to try them. Quinta do Tedo makes only red wines. 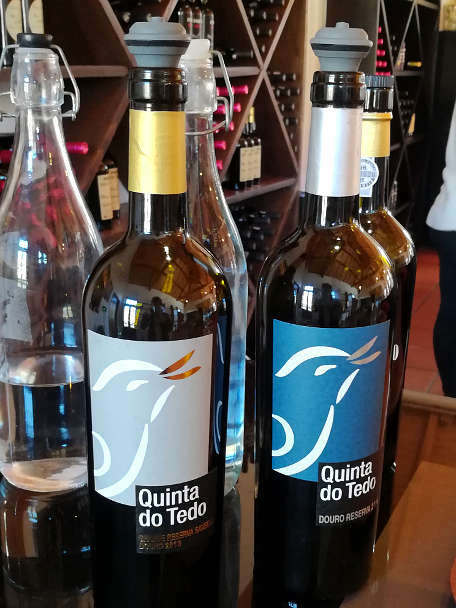 The winery’s logo has a picture of the Black Wheatear bird, which according to the local traditions, the birds would show up to eat the grapes when they are perfectly ripe. So, the bird on the label signifies perfectly ripe grapes. The tasting started with a light, floral Rosé Port. It was at that point when Rosemary realized that she could taste the organic table wines and skip the Port wines. Instead of tasting three wines, Rosemary tried two different reserve wines. One was a Grande Reserva Savedra 2013, and the second, Douro DOC Reserva 2014. Both red wines were excellent. Intense aromas with a hint of fruity flavors and the added complexity of spice and woody flavors. These are enjoyable and easy to drink organic wines. If you decide not to eat at Quinta Nova, Pinhão town, which is centrally located on your journey offers solid lunch options. On your way back from Quinta Nova, we recommend Restaurante Cais da Foz. 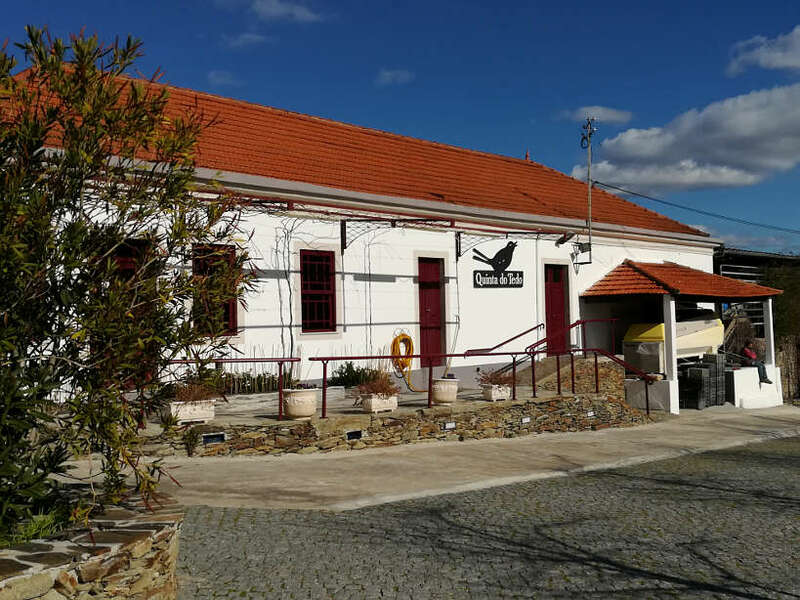 This casual, no-frills restaurant located just before the bridge that leads to Pinhão, is a local favorite. A simple menu with local Portuguese foods await. Choose from grilled meat, fish or omelet served with homemade fries, rice, and salad as well as the local red wine. Be aware of the large portions and plan to share. This local restaurant is a nice stop to restore before your next winery stop. On our trip in the Douro Valley, we chose to stay in Tabuaço, a small village up in the hills surrounded by the vineyards, a few miles from Pinhão. Tabuaço offers a couple of options for dinner. 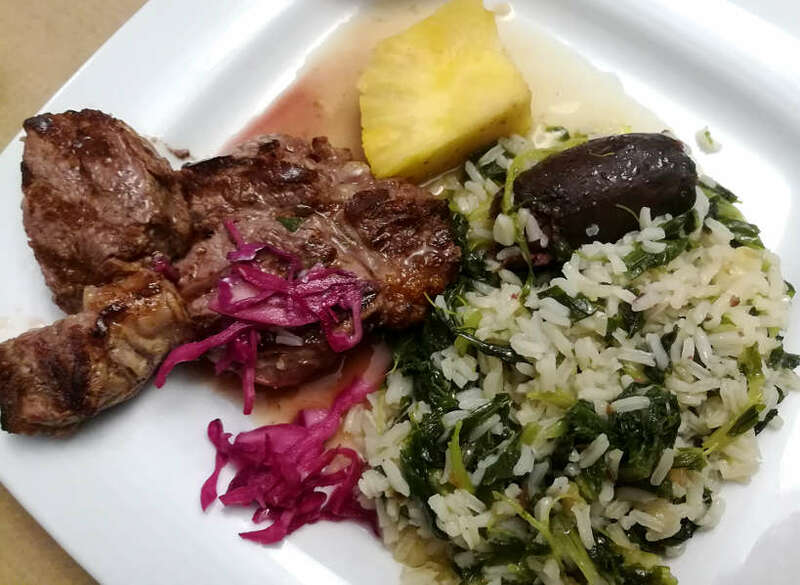 We recommend O tachinho da té, a local restaurant serving traditional specialties from the region. To start, you want to taste the Alheira sausages. 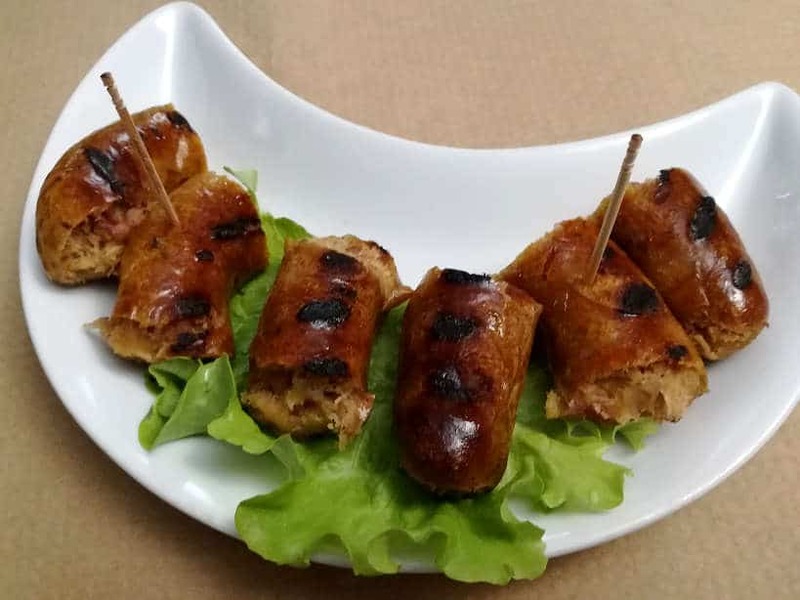 These smoked traditional sausages from the northern region of Trás-os-Montes are served grilled as an appetizer. 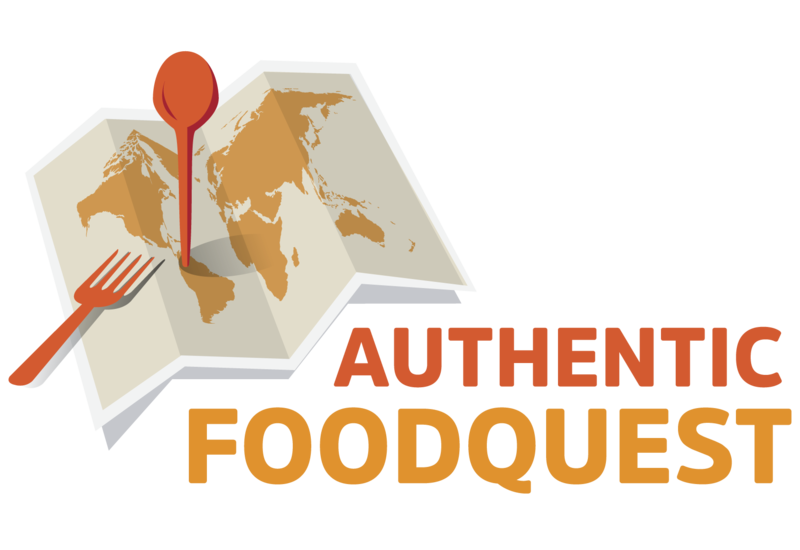 To read more about the Alheira sausages, read our article about Porto regional foods. Don’t miss the specialty of the house, the roasted veal with marinated rice called Filé de Vitela arroz de grelos com moira. The veal was very tender and juicy. The rice is marinated with Rapini, a type of broccoli, olive oil, and pieces of Moira, a traditional blood sausage. The Moira sausage is prepared with red wine, blood, garlic, onion and laurel. 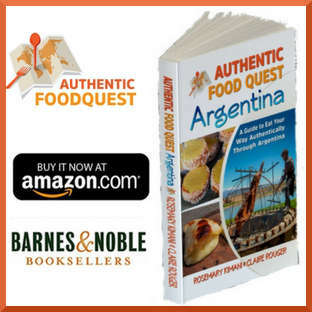 This rice dish is soupy and very flavorful with the sausage giving wonderful smoked pork aromas. The food is plenty and the meat delicious. Prepare to share or come with a big appetite! With bold and rich red wines, the Douro Valley is a magical place to tour the local wineries and discover native Portuguese grapes. It is fascinating to taste the results of grapes growing on steep terraced vineyards under harsh conditions. The wines of Portugal and the Douro Valley will not leave you indifferent. 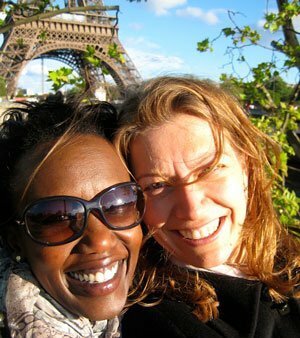 The wineries, despite the rustic atmospheres, offer intimate world-class visits with tours offered in multiple languages. While visiting the local wineries, adopt the local slow pace. Do not rush to the next visit, take your time to admire the landscape; choose quality other quantity. In any case, the steep and curvy roads will bring you back to reason. The charming villages await for your stay and your palate will thank you. A visit in the Douro Valley will have you fall in love with its magical landscape, local cuisine and exquisite wines. While visiting Quinta Nova, you may want to consider simply staying on site at the Quinta Nova Luxury Winery House. Described as “Heaven in the Douro Valley”, you can expect world-class amenities, a restaurant featuring exceptional regional cuisine, and excellent wine pairings. Slow down, enjoy the spectacular views and soak in the Douro Valley experience. If you’re planning on visiting Quinta do Tedo, we recommend staying at Quinta do Tedo for a unique experience. This family run bed and breakfast attached to the Quinta offers wonderful views, overlooking the Tedo River, olive trees and the vineyards. With a bistro offering local fare, you can extend your tasting with a lunch or dinner. A delicious breakfast is served every morning. Quinta do Tedo also provide bicycles, canoes and free use of binoculars for bird watching. This is a real gem in the valley! If you’re planning on staying in Pinhão on your trip to the Douro Valley, treat yourself to the Vintage House Douro. A former 18th-century wine estate, this luxury hotel offers panoramic views overlooking the vineyards, the Douro and the Valley. With a large breakfast and a restaurant on site, you have all your needs covered in the heart of the valley. Doesn’t it seem like every scene in wine country is gorgeous Claire? I rolled through the South Island of New Zealand last month. Breath-taking. But ditto any region with vineyards, world-wide. Rocking post! You are so right, wine regions are just gorgeous. What was unique about the Duoro Valley were the steeped terraces and being in the oldest demarcated wine region in the world 🙂 Have not made it to New Zealand yet. Can’t wait to discover the wines there soon. Thanks for stopping by Ryan. This post was so informational. I’ve had Portugal on my travel list for a few years now. 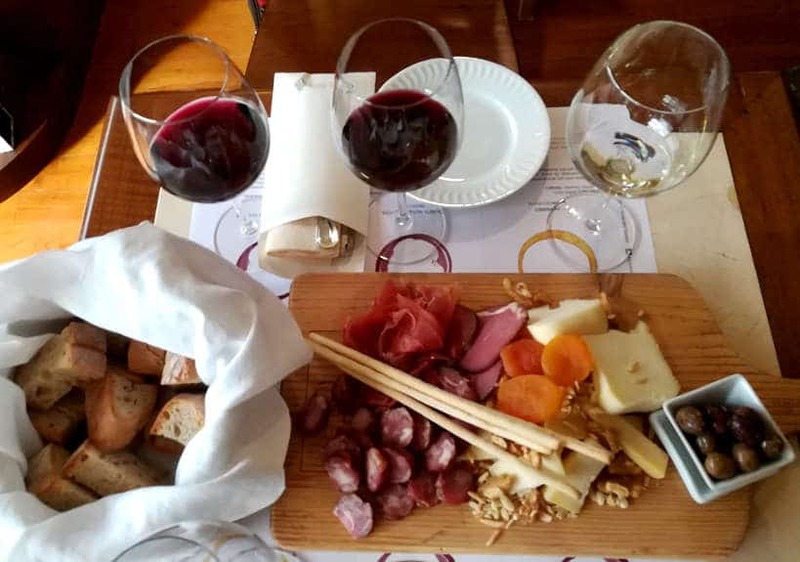 I don’t drink wine (poor me, allergic to some grape varieties) but I still love to tour wine regions and vineyards – especially if I’m with someone who can sample. You mentioned that car rentals are totally affordable. Was it easy to drive there as well? Oh that’s bummer that you are allergic to wines. Not to worry, you’ll find so many other local beverages to savor in Portugal. Don’t let that stop you from visiting one of the most beautiful countries out there. To answer your question, driving was easy too, but specifically outside of Lisbon. You don’t need a car in the capital. Thanks, Tess. Wow, the undulating curves of the Douro wine region hillsides create a beautiful and dramatic landscape ! 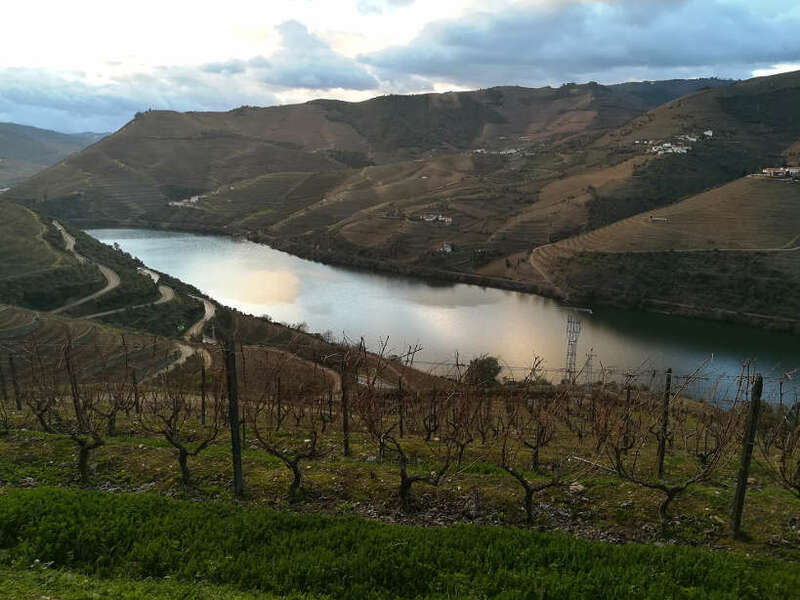 I understand why the Douro Valley could as easily be called the enchanted valley 🙂 I’m not a huge fan of wine but for sure I won’t miss the stay in Tabuaço to taste the Filé de Vitela arroz de grelos com moira ! Whatever your beverage pleasure, you will find it in Portugal. If wine is not your cup-of-tea, the craft beer scene in Portugal is growing. The Filé de Vitela arroz de grelos com moira in Tabuaço is certainly worth it!! I really want to visit Portugal and although I’m not much of a wine drinker, the scenery looks incredible. So pretty and relaxing. Will definitely keep this place in mind when I go. There is more than wine in Portugal…don’t let that stop you from visiting soon 🙂 Thanks for stopping by. 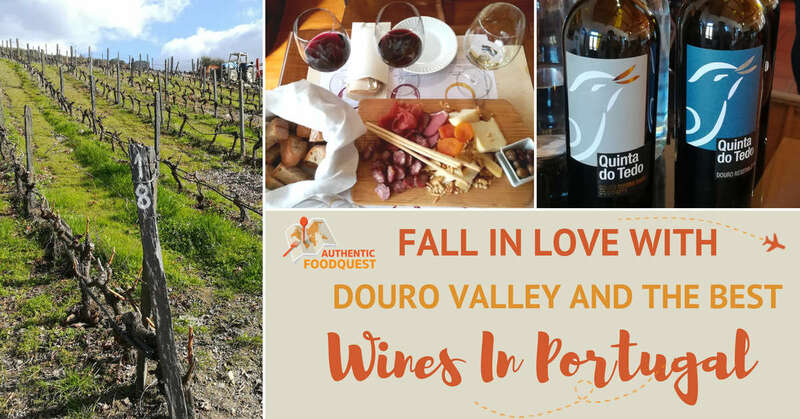 I went to the Douro Valley last fall and fell in love with the food and wine. I agree it is some of the best wine and cuisine in Portugal. This blog really brings me back to exploring the rover valley as well. The train ride is just stunning. Awesome to read that you loved the Douro Valley as well. Having a car made it easy and very flexible as well. Did you have a favorite Quinta? Thanks Alice for stopping by. This sounds so lovely. I love wine tasting and didn’t even think about wine tasting in Portugal. I love how affordable renting a car in Portugal is. Also, that charcuterie plate looks amazing! It’s true that Portugal’s wines are not well known outside of the country. 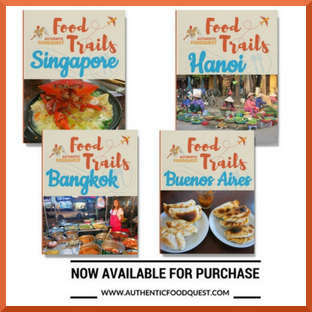 We hope through this article to help spread the word about the amazing local foods and wines. The car rental prices really surprised us, in a good way! Thanks, Candy. Wowowow! Did someone say wine? My Portuguese friend was always so proud of their wines. He’s invited us over and over to Lisbon and go and explore Portugal with him but we still haven’t gone. 🙁 But when you said prepare for a slow paced wine tasting, I was like, that’s what we need to do in Portugal! Now added to our list which hopefully we can do soon. Very helpful detailed article! So glad you enjoyed the post Mariann. What are you waiting for?? Take your friend up on the offer and explore Portugal with a local. You will love it! Hope you get there soon! Cheers. I’ve never visited a wine region before. This place looks gorgeous and delicious! I’d love to visit and taste the wine and see how it complements the food. Thank you. So glad you enjoyed reading about the experience of visiting a wine region. It’s really fun and something worth considering. Hope you have a chance to visit one soon. Thanks for stopping by! Thank you. So glad you enjoyed the article, despite not being a wine drinker. 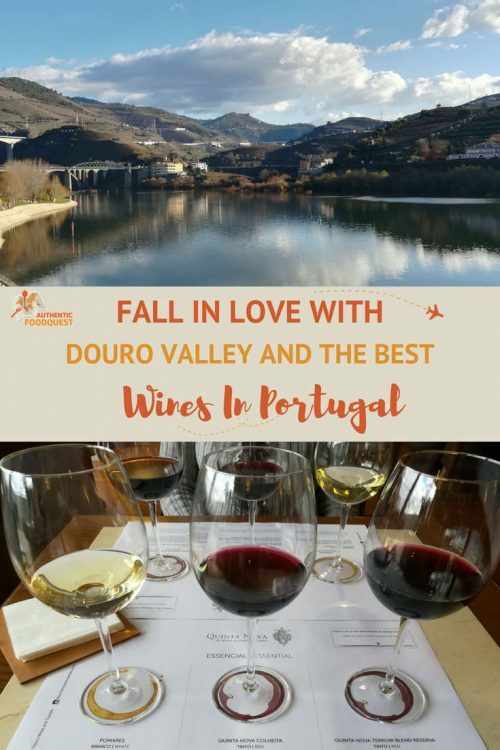 The Douro Valley is indeed worth visiting if you get a chance 🙂 Thanks for stopping by. Your tips on car rental and the toll pass are really helpful. Thank you! You are most welcome, Annemarie. We are already a big fan of Portuguese wine (especially the reds) and food but we still haven’t taken a trip along the Douro Valley. We hope to next spring as it’s quite easy to get there from the UK. We could spend a week there exploring the wine areas. A trip to the Douro Valley is definitively worth it. And you are right, plan for a week if not more 🙂 Thanks for stopping by. I was just talking about Porto a couple days ago. Glad to hear Douro Valley is so close and car rental is inexpensive. Thanks for the tip about the toll roads! That’s perfect timing!! And so glad the tips about the car rental are helpful. Do let us know what you discover when you go. Cheers, Sherianne. Oh my gosh Douro looks like a slice of heaven! There is a Portuguese wine shop in Munich and I love buying my wine from there, but it is a dream to go to a winery in Portugal. I’m a huge fan of organic wines, so I would definitely be staying at the organic winery. What a great detailed guide! Thank you Susanna. So glad you enjoyed the article. That’s great that you have a dedicated Portuguese wine shop in Munich. Unfortunately for us in the U.S., the liquor stores or wine shops carry a very limited selection of Douro Valley wines. Yes, Quinta de Tedo is quite amazing for the wines and the experience. Hope you get to Portugal soon. Like the strong character of Dona Antónia Ferreira who confronted all men winemakers in the Valley. No wonder the wines by Casa Ferreirinha are some of the best in the Douro Valley . Only exceptional personalities can produce exceptional wines! I have always wanted to bike through the Loire Valley but Douro seems like a beautiful alternative, especially when they offer free bikes at the B&B. I would want to avoid the scorching 100 degree weather, but that sounds doable. The small plates and sausages look really good too. The key to successfully riding through the Douro Valley is going off season 🙂 The reward will be the delicious petiscos plates and fab wines. Let us know if you do end up biking in the Douro Valley! Visiting the Douro Valley is on my list for my next trip to Portugal. When I was there we sampled some wonderful Port in Porto, but we didn’t make it into the Valley. I definitely want to make it a priority to stop at Casa Ferreirinha Wines because you know, girl power! Great post! Thanks so much Paige for your feedback. A trip back to Portugal and to the Douro Valley is certainly a great plan. And totally agree, Casa Ferreirinha Wines are a must!! Thanks for stopping by. I’d love to visit the organic vineyard where they still use traditional production methods like stomping the grapes by foot! I feel like the wine tastes better when you know the effort that went into it. And wow really, 5 euro to rent a car? Sold. You are right Carrie, when you know a more about what goes into making wines (or local foods), you have a deeper appreciation for the end product. For a 5 euro rental, you can’t go really go wrong in the Douro Valley!! Douro Valley in Portugal is so damn gorgeous. I am already in love with it and the best if so many varieties of wine. We will love tasting them all. Car rental is really less and I to feel it will be the best option for sightseeing. The Douro Valley is incredibly inspiring and a great place to spend time. The beauty of the region and the incredible wines make the perfect match!! Wow. They all look and sound wonderful. I don’t drink wine, but I will never pass the opportunity to see vineyards. I love looking at them. Can’t belive car rental is so cheap, was it easy to drive there? Glad even as a non-wine drinker you can still appreciate the beautiful Douro Valley region. Yes, it was pretty easy driving in the region, though some of the roads were narrow and with twists and turns. It’s easy to get around. Thanks Carmen for stopping by. I don’t know anything about wines but this place is heaven on Earth. Such abundant beauty and you feel lost in nature. Well captured, Shilpa. A truly spectacular and beautiful region to visit. Thanks for stopping by! This looks beautiful!! I would definitely go there if I ever make it to Portugal!! If your Portugal is on your travels plan Tif, I highly recommend going to the Douro Valley. 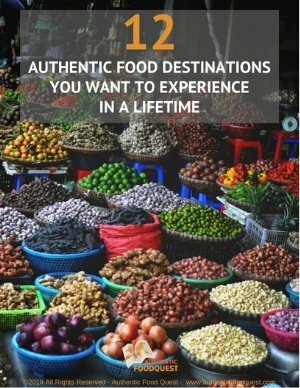 From the food, wines and natural beauty, it is truly a remarkable region. I love wine tasting and Douro Valley looks divine! And that breathtaking vineyard landscape is such a bliss for the eyes! I hope to visit there soon! 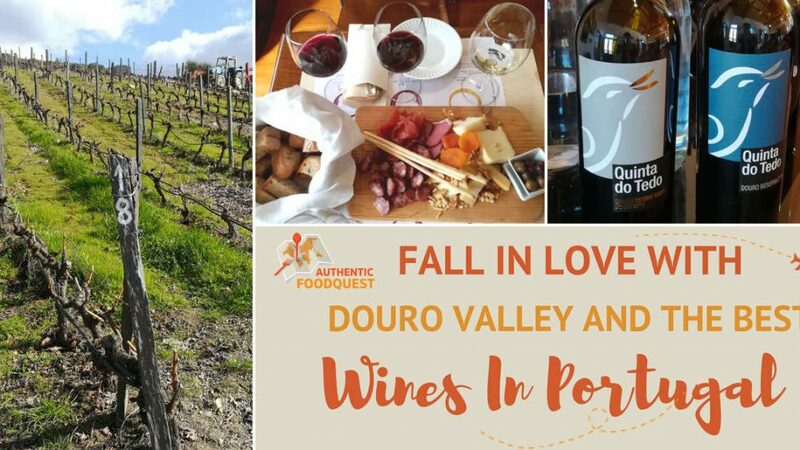 If you love wine tastings, then Douro Valley is the place to go. So many delicious and unusual wines you won’t find easily around the world. Hope you get to visit Douro Valley soon. Oh my! This is indeed the best ever! Love the view, and the food looks delicious too! Douro Valley looks beautiful not only as a wine region but even otherwise, so beautiful! I’d love to take a road trip to this place and I can’t believe you can rent a car for as less as €5 for a day in Porto! I love road trips especially when it is in such scenic places. Also, because I love wines, I have the incentive to try a variety of wines which is another reason I’d love to visit this place. Thanks for the recommendation! You are most welcome Medha. So glad you enjoyed reading and discovering the Douro Valley through the article. We’d recommend spending a couple of days in the region to get the most out of the experience. Besides, with all the amazing wines, you’ll need to take a break 🙂 Cheers. I’m planning a trip to Portugal in March by way of Spain. I’m not a big red wine fan, at least what we have in the US. White wines I kinda stick to Riesling, Sauvignon Blanc or Chenin Blanc. When I travel I give the areas wines a try. Wines are so different in other countries and better to me. But I love Port’s and that one of the reasons for going to Portugal. I plan to drive from Porto to Douro Valley. So which of the wineries would you recommend on a day trip other than the ones you have mentioned, if you tried anything others. Hi Teresa, thank you so much for your feedback on our article. We really enjoyed Portuguese wines and in many cases found them better than most wines we’ve had in the U.S. Unfortunately, we didn’t visit more wineries than the ones we highlighted. Our goal was to travel deeper and visit fewer wineries and spend more time learning about the wines, rather than trying to hit several wineries. The roads are also quite narrow and steep and we didn’t want to be driving between tastings. You’ll have a great time and the beauty of the Douro Valley is breathtaking. Enjoy! !